We all sat together and ate pizza while we were talking and having a lot of fun. "So (Y/N), what were your thoughts towards us after you had found out Brendon wanted you to sing?" Kenny asked. "Well to be honest, my thoughts didn&apos;t kick in till the music started but when I finally hit reality I was like &apos;im gonna kill you all&apos;" I said and everyone laughed. "Oh come on now, you wouldn&apos;t kill me, you love me to much" Brendon says sitting me in his lap and laying his head in between my neck and shoulder. I smiled and ran my fingers through his hair which made him smile. "AWWWW" Tyler, Josh, and Dallon all said at the same time which made us look at them and smile. 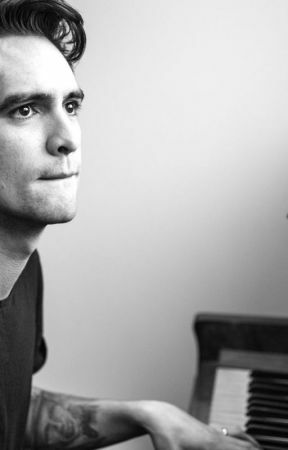 I just look back at Brendon and smile as I ruffle his hair and he pouts. "Hey!" He says trying to fix it. "You look so cute with messy hair though" I say as I ruffle it again and he just chuckles and gives up. I look at my phone and check the time. 11:30 pm. "Guys its getting late and we need to start driving to the next tour stop." Tyler says and the guys agree and head back to their bus as we all get ready for bed. 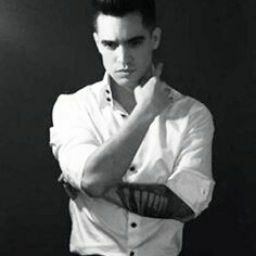 I was just sitting on the couch waiting for Brendon to get back from changing. When I had walked out to the couch (Y/N) was shivering so I decide to go and get my sweater and when I walked back to her I put it on for her. She looked so cute in it. "Thanks." She said. "Yeah, no problem. You look better in my clothes anyways." I said and she started blushing. Man, I was freezing. Brendon just gave me his sweater and cuddled up next to me on the couch with a blanket. Pretty soon I had closed my eyes and fallen asleep. When I woke up I was in bed so I can imagine that Brendon carried me there. I was the first one awake so I decided to brew some coffee for everyone. While I was standing there watching the coffee pour into the pot, all of a sudden I felt long strong arms snake around me. It was Brendon. He had pulled me backwards into his chest while he placed his hand on my stitched cheek and he was gently rubbing his thumb across my cheek. "Good morning beautiful" He said in his low, raspy morning voice. "morning. want some coffee?" I asked pouring myself a cup. "Yeah, but I can get it" He says kissing my cheek. "Brendon, I can g-" I say but once again I get cut off by Brendon. "Don&apos;t be silly, I can get it, go sit down" So I decide not to argue and listen to him. Soon after he joins me on the couch and we sit and talk. Since we were driving and didn&apos;t have anything to do Tyler and Josh were still sleeping. "So, now, im guessing you know enough about me, I want to know more about you." Brendon says putting his coffee down on the small table and he put his arm around me. "Well, what do you want to know...I mean, I don&apos;t want to talk about myself all day...I tend to do that sometimes..." I say and Brendon just smiles. "That&apos;s perfect, do you think you could do that now? I want to know everything about you." he says placing his free hand on my thigh which made me blush a little. "ok...um, ask me a question, anything." I say and he immediately responds. "Did you have any special family traditions?" All I could do was get a little sad at the thought of my favorite family tradition. Skiing. "Uh, yeah, I did have one. When I was a baby my parents would always take me up to this ski resort and we would spend a week there. Ever since I was two I had started learning how to ski." -(A/N) that is true by the way, I have been skiing since I was two years old-   I say. "So, what happened, did you ever stop or?" He asked and he seemed very interested in it so I kept going. "Well after I turned about, hmm? 14 my dad left my mom and we started to lose money. Soon enough it came time for our ski trip but my mom had told me that we didn&apos;t have enough money. We...uh...we couldn&apos;t go th-that year or the after, o-or the year after that." I say trying not to cry. "It uh, it was like a second home there...we knew all the people and haha, one thing I always remember was this one boy named Aiden. I had the biggest crush on him. I would always try to sit next to him on the ski lift and he was really funny." I say trying to make myself happy instead of sad but it wasn&apos;t helping. All I could do was get more sad and remember all of my childhood memories. "I remember every morning getting dressed in my snow clothes and going down to eat breakfast with my mom and dad. My favorite thing to get was a made to order omelet. haha, I would always get one. The chef knew me so well, we were like good friends. He would always just chit chat with me and it was fun." I said and at this point I was trying not to cry just thinking about all the fun memories I had. "hahaha, always on Thursday was a race day for students. I would always have bad luck and hurt something so It made it hard for me to ski. And at the end of the race they would always have hot chocolate and afterwards me and my parents would go into the lounge and order nachos while they announced the winners. I had always won first place even with a spraind ankle or wrist. Man it was so fun. And, the last year that I had gone to the resort, I was 13 and I had been done with classes, I was known as a pro skier and my parents allowed me to ski without supervision and I was so happy. That year was one of the best ones But, after I found out we didn&apos;t have enough money to go...that&apos;s when my depression started. and I thought I would never get to ski ever again." I said as I let a tear fall down my face and Brendon quick to respond wiped it and hushed me. "Its ok. Im gonna take you there. Just you and me. And you can teach me how to ski."